Seems like forever we’ve been waiting for the new R1200RT. A year has passed since we rode the Honda ST1300, Kawasaki Concours 14 and Yamaha FJR1300 to Death Valley and back for our 2013 Sport-Touring Shootout. Since then we’ve been in a holding pattern to take the winner of that shootout, the FJR, and put it up against Triumph’s Trophy SE and the new RT. 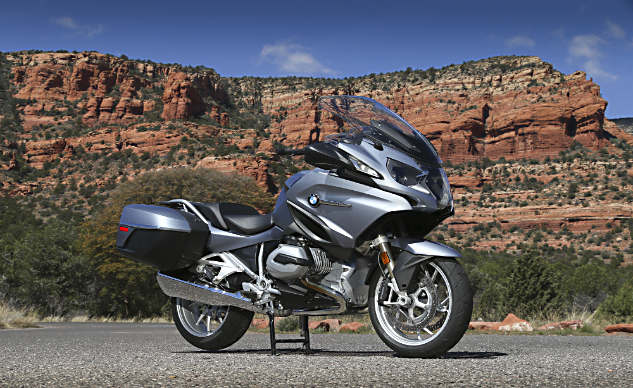 Well, now that we’ve ridden the new R1200RT the shootout with its contemporaries is on-deck. A long day in the saddle of the 2014 RT riding through the stunning, red rock scenery surrounding Sedona, Arizona, provided valuable insight into BMW’s newest sport-touring Boxer. It’s too soon to say how exactly it’ll fare when ridden back-to-back against its competition, but there’s a lot to like with this new and improved version, including a basic flatlining of the 2014 models’ MSRP that effectively ups the value quotient of the upgraded RT. 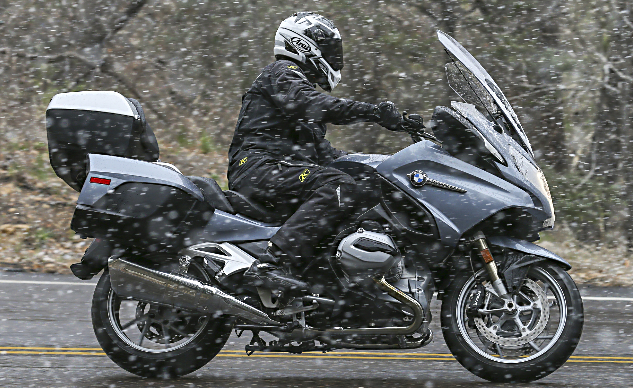 BMW managed to take a bike with an excellent all-weather reputation and improve its protective qualities. Outfitted for comfortable riding in low-60-degree weather, I was unprepared for an early-spring snowstorm. Enveloped by fat, falling snowflakes and temperatures in 30s, it was time to switch on the heated hand grips and seat, adjust the windscreen to its high position and think warm thoughts. We can’t heap enough praise on the RT’s excellent weather protection. One journo was wearing perforated summer gloves and still claimed his fingers remained warm in the wintry weather; he was Canadian, so take that comment with a grain of salt. I didn’t have to think hard, though, because the RT’s wind-tunnel optimized windscreen, transparent slipstream wind deflectors and perfectly positioned mirrors managed to fend off all but the nastiest broadside winds from reaching me. Wearing only thin riding socks beneath my boots, even my toes maintained warmth due to the RT’s excellent lower fairing protection. Without the windchill effect and with the warmth provided by the heated seat and grips, I rode comfortably until returning to our resort, and could have continued riding given the option. The only drawback of having the windscreen in its highest position is that the top of it cuts directly through my line of sight (I’m 5’ 11”). When the snow wasn’t falling and temps weren’t as frigid, I preferred riding with the screen about an inch from its highest position allowing an unobstructed view over its rim. At this height, any increase in wind noise or helmet buffeting is negligible. Otherwise, in the low position, I felt non-turbulent windflow from my shoulders up. The instrument cluster of our test unit includes both the Garmin GPS, new TFT color display and new backlit dials. The clean layout and high resolution of the TFT display makes easy work of absorbing a lot of information. In other other ergo news, BMW managed to narrow the frame at the seat/tank juncture, which, in conjunction with the compactness of the new precision-cooled Boxer Twin (which I’ll get to momentarily), allows for a 0.8-inch lower rider triangle. Riding with the standard seat in its high position, my 32-inch inseam managed a flat-footed stance at stops, and because of this, I think the high seat in its high position will be preferable for me because it’ll afford more seat-to-footpeg leg room. The 2014 RT’s lowest seat height is within 0.4 inches of last year’s model outfitted with the low seat and lowered suspension: 29.9 inches vs 29.5 inches, thus BMW has eliminated the lowered suspension option. Riders on the new model will also enjoy a 0.8-inch increase in seat length while its passenger seats get an 0.4-inch increase. What’s to be said about BMW’s new precision-cooled Boxer (first seen in the 2013 R1200GS) that hasn’t already been said? Well, how about the fact that the RT’s version features a two-pound increase in crankshaft journal mass, while the more powerful alternator (from 510 to 540 watts) increases its mass by 1.3 pounds. The increased mass of both combine to create more engine inertia, giving the opposed-Twin a heavier flywheel effect. Beemer traditionalists may find the engine takes some getting used to, as its character and sound will be unfamiliar from what they’re accustomed. BMW claims, however, the result is a smoother engine, which is true at freeway cruising speeds and below, but the nearer to redline you venture, the more vibration tends to creep in through the handlebars. Even with a 0.8-inch reduction in rider triangle height, cornering clearance remains ample. The top box is an accessory, but the saddlebags are stock equipment. But high-revolution riding isn’t what the RT is about. Staying lower in the rev range and using engine torque to squirt out of corners is the RT’s strong point, and to help with this practice are longer secondary transmission ratios. Otherwise, the RT enjoys improved engine performance to the tune of 15 horsepower and three ft-lbs of torque over the previous air/oil-cooled model. Elevating the sportiness of the RT’s engine most of all has got to be the Shift Assist Pro. BMW lingo for quick shifter, the Pro version on the 2014 RT adds clutchless downshifting to the recipe, giving the RT a more advanced quick-shifting technology than most top-shelf sportbikes. Coming fast into a 20-mph corner, simply close the throttle, tap down on the shift lever and the Shift Assist Pro instantly matches engine revs and seamlessly grabs a lower gear. Upshifts are met with the same fluidity. Just don’t expect it to work at around-town speeds or half-throttle inputs where clutch operation is needed to maintain smooth transmission engagement. The Shift Assist Pro is a sporting technology meant to be used as such, emphasizing the sport in the sport-touring equation. 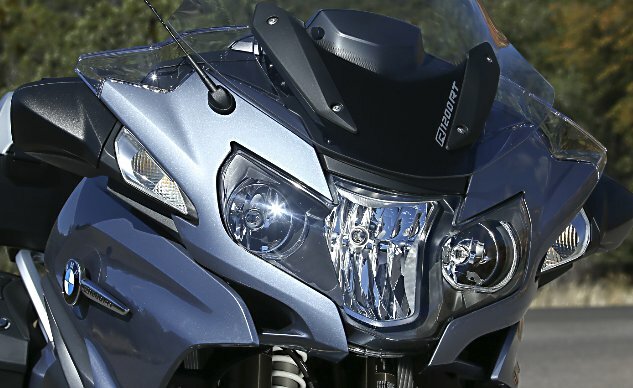 Headlight Pro sounds impressive, but the term means that you’ve opted to include LED Corona Rings around the headlights, not the adaptive headlights of the K1600. My only complaint is that, when using the clutch, I found its very narrow friction zone at the end of the lever’s throw difficult to manipulate. Slow speed maneuvering was met with a herky-jerkiness I hadn’t mastered by the end of our ride. Another new addition on the RT is Hill Start Control – a technology that helps to get a fully loaded RT underway from a dead stop on a steep incline. To actuate, a rider applies a firm pull on the front brake lever to engage the rear brake, after which the rear brake’s caliper maintains pressure on the disc, holding the bike in place. With the rear brake engaged, a rider can maintain a stable, two-footed stance while manipulating throttle and clutch operation, easing the transition from standstill to forward motion. 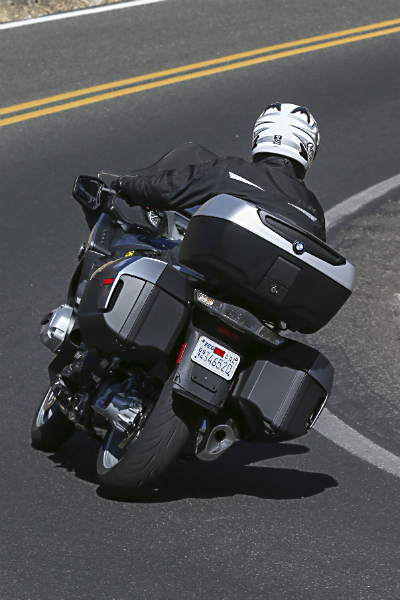 The process demands more throttle input than a normal launch requires, but Hill Start Control is a technology any touring rider who’s struggled with a weighted motorcycle at a graded stop will immediately recognize as beneficial. In the handling department, a new continuous tubular-steel bridge-type frame was designed to increase rigidity and road feel. This new frame, says BMW, in combination with the more compact Boxer engine, lowers the bike’s center of gravity. The in-motion result is the illusion of the RT being more petite than its actual size. As one of the lighter sport-touring bikes available today, (604 pounds with its 6.6-gallon tank full), the RT navigates long sweepers and tight switchbacks with equal aplomb. The RT is both nimble and stable, making for a great companion on twisty mountain roads or long, deserted straightaways. 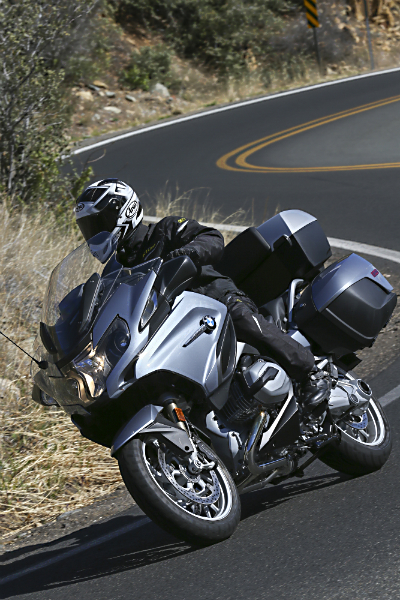 BMW is a leader in the use of modern electronic rider aids, and the 2014 RT comes with a host of new electronic highlights. Having mentioned the new Shift Assist Pro and Hill Start Control, BMW also brings to the game Dynamic ESA, Ride Mode Pro, On-Board Computer Pro, GPS Preparation, and a large TFT color display. Dynamic ESA electronically adjusts suspension damping to one of three settings, Soft, Normal, Hard, depending on the Riding Mode selected. The setting can, however, be changed to your personal preference. 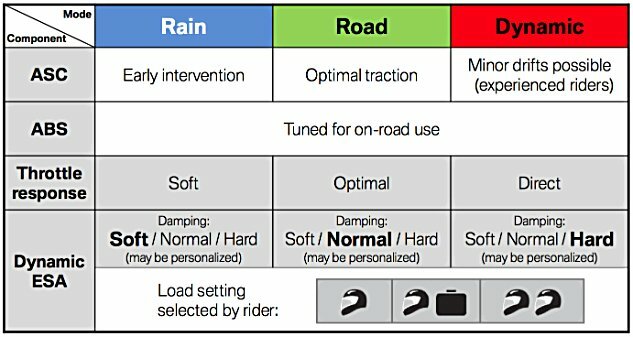 For example, if you’re in Dynamic riding mode which automatically sets suspension to Hard, you can choose to change this to either Normal or Soft while keeping the riding mode in Dynamic. Like other motorcycles with electronically adjustable suspension, I find that while ESA takes away some of the fine-tuning capabilities of twisty knobs, the convenience factor is worth the tradeoff. For those unconvinced, base model RTs still come equipped with unplugged shocks. The TFT color display is new to all 2014 versions of the RT. The 5.7-inch window displays information from the RT’s onboard computer and audio controls. 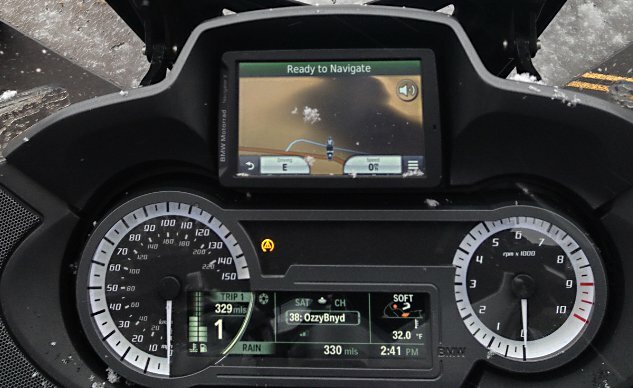 Using the multi-controller and various fairing-mounted buttons, the TFT color display provides the rider with all the current settings such as Ride Mode, suspension setting, ambient temperature, tire pressure, radio channel selection, etc. While I noticed an occasional reflection made viewing difficult, the screen is adjustable to two positions. For the US market, BMW is focusing on R1200RTs outfitted with the Premium Package, because that’s how (we’re told) us Americans roll – go big or go home. Our test bike was outfitted not only with the Premium Package but also with these options: Central Locking ($400) and Gear Shift Assist Pro ($475). There’s also an Anti-Theft Alarm ($395), or get all three for the package price of $850, bringing the total MSRP to $21,700. 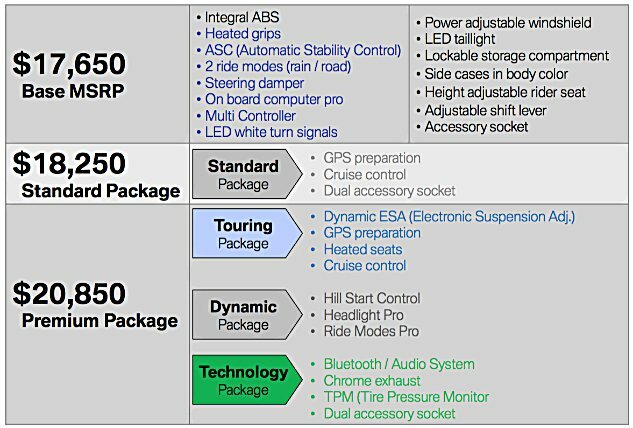 Oh wait, the Garmin GPS unit is also sold separately for around $850, increasing the price to $22,550. As mentioned in the beginning of this article, the 2014 RT represents a good value, at least when compared to the outgoing model. While pricing for the Base model did increase $300, it actually fell $100 for the Standard model and remained the same for the Premium model. Considering the increase in standard componentry, the new R1200RT gives you more motorcycle for less, the same and not much more money. At $15,890 for the new FJR1300A, also with electronic suspension (reviewed here), we’ll soon see how much of a value the new RT is when compared to competing models from other OEMs. Look for our Sport-Touring Shootout 2.0 coming soon!